Mechanics of Nanostructured and Advanced Materials Laboratory | Slogan bu alana yazılır. Nanomechanics laboratory conducts research at the intersection of mechanical engineering, nanotechnology and materials science. Research activities include a combination of experimentation and modeling to gain insight into materials behavior at the micro and nanoscale. Both graduate and undergraduate students are welcome in our lab. Please send an e-mail to ozerinc@metu.edu.tr to learn about the ongoing projects. 2018-07-30 TÜBİTAK 1001 Proposal Accepted for Funding. 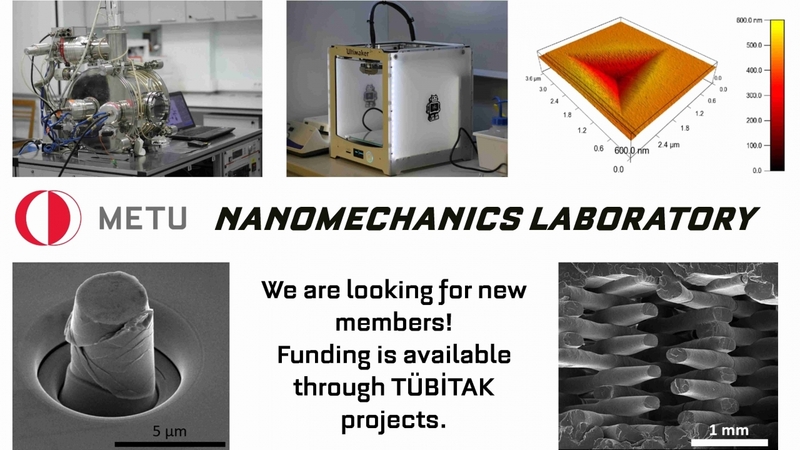 Nanomechanics group will investigate the fracture toughness of hard coatings and develop new generation nanostructured tough coatings in a new TÜBİTAK 1001 Project - Development of High Fracture Toughness Hard Coatings. 2018-07-25 Nanomechanics group welcomes two new members! Mutlu Karaşoğlu will start Ph.D. in our group working on the synthesis of nanostructured materials by spark plasma sintering. Mehmet Kepenekçi will start M.S. in our group working on the finite element modeling of the plasticity of nanostructures. A certificate was awarded by METU Graduate School of Natural and Applied Sciences to our M.S. student Mohammad Abboud as the most successful student in the M.S. Program of Micro and Nanotechnology for the 2016-2017 academic year. 2018-03-15 Nanomechanics group presented in TMS 2018. Dr. Sezer Özerinç presented the recent findings of Nanomechanics group on the CuZr/Zr metallic glass nanocomposites in TMS 2018 Annual Meeting & Exhibition in Phoenix, USA. The work has been done by M.S. student Mohammad Abooud and our collaborator Amir Motallebzadeh from Koç University. 2017-12-01 Nanomechanics group presented in 2017 MRS Fall Meeting. Dr. Sezer Özerinç presented the recent progress on the mechanical characterization of CuNb/Nb nanolayers in MRS 2017 Fall Meeting & Exhibition in Boston, USA. The work has been done through a collaboration with Dr. Verma and Prof. Averback from University of Ilinois at Urbana-Champaign.